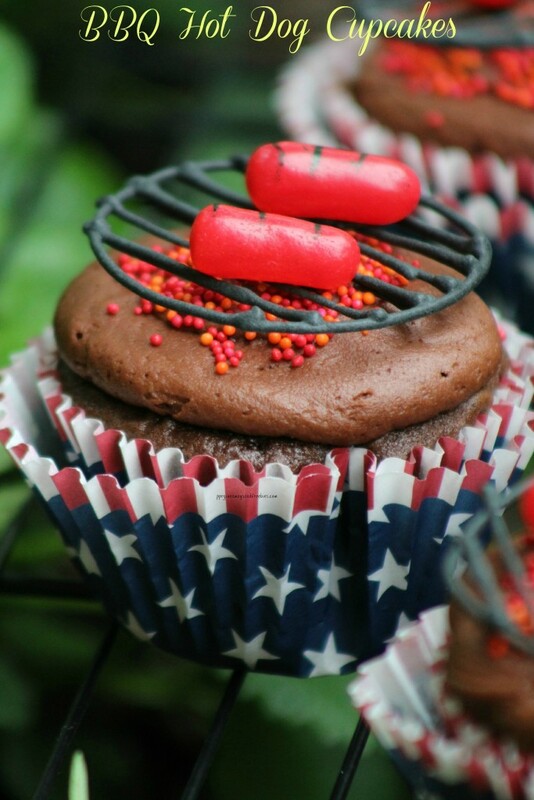 This is a fun recipe for the 4th of July and summertime. Line cupcake pan with paper liners. Combine flour, baking soda, salt, and cocoa. Cream butter with sugar until light and creamy. Add one egg at a time, beating well after each addition. Alternate the addition of the dry ingredients and milk with the creamed mixture. Beat until smooth after each addition. Scoop batter into lined cupcake tins. Bake at 350 degrees for 20-25 minutes or until an inserted toothpick comes out clean. Cool in the cupcake tin for 10 minutes. Remove from cupcake pan and cool on wire rack. Beat the softened butter until its creamy. Add cocoa and powder sugar alternately, mixing after each addition. Mix well… add a small amount of heavy whipping cream after each addition if it doesn’t cream until it becomes creamy. If the frosting is too thick, add more heavy cream, if too thin, add more powder sugar, a 1/2 cup at a time. Take a large spoonful of frosting, turn the spoon upside down if the frosting stays on the spoon then it is done. If it drops off the spoon add more powdered sugar and mix well. Spoon the frosting into a pastry bag with a frosting tip. Frost the cupcakes with a smooth layer of frosting. Using your fingertip dipped into a small dish of water and wet the frosted cupcake to “stick” your red and orange sprinkles to look like flames.